This is one method I have not yet been successful with and I have now parked, and one which will work best in a team rather than individually - it only seems to be in the "West" where we want to do everything ourselves! It is common to see Indigenous peoples today working together to welcome in fire! 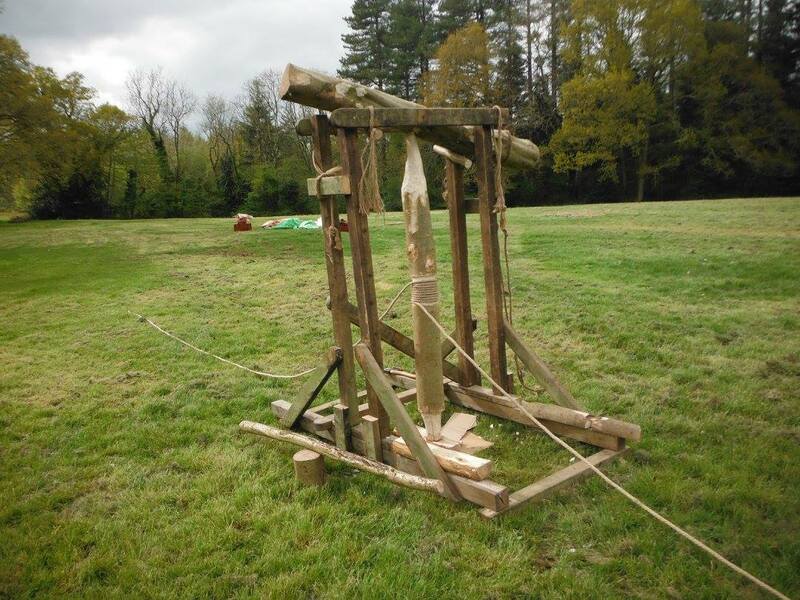 The typical fire plough consists of a stick (from medium-hard wood) cut to an angled dull point, and a long piece of softer wood with a groove cut down its length. The point of the first piece is rubbed quickly against the groove of the second piece in a "plowing" motion, to produce hot dust that then forms into a coal. A few tips : The Samoan hand hold works best as you can achieve pressure and go for longer. Hazel and punky-ish lime (and apparently Clematis) works in the UK, though it is generally accepted as being difficult in the UK and it raises the question of whether it was ever successfully used in the colder\damper climate of the Northerrn Hemisphere. North American Indigenous peoples primarily used the hand drill as opposed to the bow drill (see here) ; the Bow Drill was used more in the Northern regions e.g. Northern Canada and Alaska. The hand drill was also commonly used in South America, Africa and Australia, and it is still used by indigenous tribes today. There is also evidence in China, and is most likely the most widespread technique. Though there is no evidence of it's use within Europe, it does work with many native plants. ​The hand drill can be an effective method, it just requires regular practice. See Hand Drill section for more info. It is "believed" that the bow drill was widely used within ancient Britain and throughout the Northern Hemisphere, though there is no archeological evidence of this. There is evidence that the Ancient Egyptians used the bow drill and apparently they tied the cord to the drill (you can also wrap the cord multiple times instead) - this solves the slipping drill issue. Wrapping the cord multiple times also works really well with thinner cord which would normally snap, as it takes the pressure off the cord. I'm sure this wasn't just limited to the Egyptians though but is commonly referred to as the Egyptian method. The Bow Drill was most likely invented from the bow and arrow. ​See Bow Drill section for more info. The Bow Drill can easily be adapted to be used in a team with one person holding the bearing block and another doing the bowing - making it easier for people to learn and being more of a communal method. The pump drill was used by the Iroquois amongst others. The Pump Drill - viewed as a further refinement of the Hand Drill and Bow Drill, however there is no reason why it couldn't have predated the Bow Drill and can be found in many cultures. This is still used in woodworking today for drilling holes.It was fun to make and experiment with but I find it a bit too easy and mechanical! There are different variations\sizes of the Pump Drill and I've also seen a Spinning Top type version of it. The pump drill consists of a wooden spindle attached to a disc of wood or stone or clay (fly wheel.) A cross bar with a bigger hole goes onto the spindle above the flywheel with cord attached at each end which also attaches to the top of the spindle. The flywheel is wound up to wrap the cord around the spindle. The cross bar is then pumped up and down which makes the spindle spin into the hearth board. The weight of the flywheel produces momentum to keep the drill spinning. This method is supposed to create an ember much easily and quickly than the other methods. It was also used for drilling holes. A different wood\stone attachment can be added to the end of the spindle. The Fire Saw consists of one piece of wood being sawn across another. The Bamboo Fire Saw is used throughout Asia and I'm guessing this has been used for thousands of years. One piece of bamboo is sawed across another which has a small hole where the dust gathers and forms into an ember. 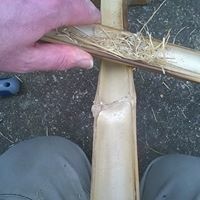 I've not yet been successful with the Fire Saw however Bamboo isn't native to the UK! I have got very very close and I may re-visit one day. Australian Aborigines commonly used the fire saw (and still do today) and they also use the hand drill and bow drill. The Fire saw seemed to have been the prevalent method where bamboo could be found (e.g. throughout Asia.) It is commonly used in the Philippines. The Fire Thong is used in Papa New Guinea (amongst other places) - a piece of rattan is pulled one way then the other across a piece of wood to create an ember. I've not yet tried this method. Another method is called the Fire Roll and also Rudiger Roll, credited to the German survivalist Rudiger Nehberg, and apparently this was first used by World War II prisoners to ignite their cigarettes. There are many YouTube videos of people using various materials for the Fire Roll. The basic concept is to roll cotton wool or dry plant fibres with ash between two flat planks of wood or stones using pressure and speed, and after time this causes friction and the fibres start to smoulder and produce an ember. The Celtic or Force Fire Churns and Slavic Fire Gates. See the Celtic Fire Churn page under Methods for more information. They apparently go back to at least the 8th century when the church banned them! They were used at times of distress or at auspicious times of the year (such as Beltane and Samhain) to ritually welcome in a new pure fire. The Vedic Fire Churn as shown in the photo below right, to ritually welcome Lord Agni within the Vedic strand of Hinduism . See the Vedic Fire Churn section for more info. One of my reconstructions of a Force Fire churn, at the Erit Suli 2018 festival. It worked beautifully well. Some interesting "theoretic" slavic methods can be seen here. I don't think many of these would work!